the warm seasons we see lots of sauvignon blancs, chardonnays, and roses. But in the fall, people are drinking more true Napa Cabernet Sauvignons, with more tannins and body. And also burgundies, which have higher acids that help cut through the fat and richness of foods like stew." Steakhouses like Smith & Wollensky are typically associated with big and bold Napa Valley cabs, and Gianaris says most of his diners come in looking for higher- end Burgundies. He does all the restaurant's wine buying and selecting in partner- ship with the national Smith & Wollensky team, and after opening the Wellesley location with an extremely tight list, he's made it his mission to talk to guests out in the dining room every night and find out what types of vintages they're looking for as he continues to build the selection through the next few months. "We have a beautiful, giant rotisserie in the new kitchen," he says. "To complement the foods our chefs roast on it, I can absolutely see pouring a lot of Stag's Leap this fall. They make a wine called The Investor, a Napa version of a Bordeaux blend. It's a fantastic wine that we offer by either the bottle or the glass, and it's perfect with a beautiful, robust steak." 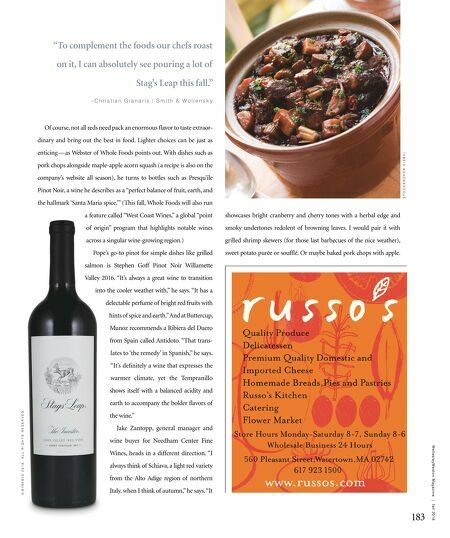 Hearty, soul-warming soups and stews make it onto so many dinner tables this time of year, and with plenty of them, Pope, of Lower Falls, prefers to pair Barolos like Ghiomo 'Vigna Granda' Nebbiolo Langhe 2015. "The grape variety is the king of Italian wines," he says. "It's become extremely popular as of late. It's transparent, yet full of great aromatics and the classic Italian dryness that's great with white bean soup or beef stew." Pastas, a cold weather staple if there ever was one, are a comfort food that bring out the best in wines such as Sangiovese. Juan Munoz is the beverage manager at both The Farmhouse restaurant in Needham and a new spot under the same ownership, Buttercup, in Natick. At both farm-to-table establish- ments, he works with small organic and bio- dynamic wine producers as often as possible, and loves pouring bottles of 2013 Castell'in Villa Chianti Classico alongside big plates of pasta Bolognese. "It's a great example of what chianti should taste like without breaking the bank," he explains. "It has tones of beau- tiful red fruit, rosemary, earth, and enough tannin and acidity to pair amazingly with the Bolognese." 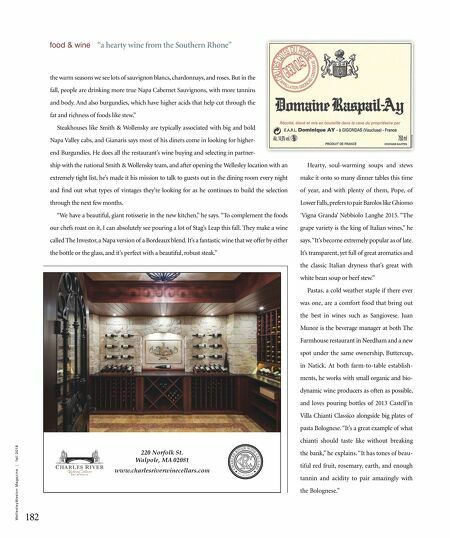 182 W e l l e s l e y W e s t o n M a g a z i n e | f a l l 2 0 1 8 food & wine "a hearty wine from the Southern Rhone"